If you have multiple keyboards in your studio then you can save space by getting this two tier keyboard stand. It saves tons of room and looks really nice. It is built extra wide and is very sturdy. Both the top and bottom are fully adjustable. 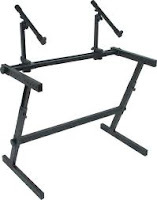 The company Quick-Lok makes some really nice keyboard stands. It sells for only $150 at Guitar Center. Get an exclusive deal with the link below.. Height positions (7): 26-3/10", 27-1/2", 28-7/10", 29-9/10", 31-1/10", 32-3/10", 33-2/5"
2nd tier height positions (4): 9-1/5", 10-1/5", 11-1/5", 12-1/5"
Overall weight capacity: 250 lb. 2nd tier weight capacity: 75 lb.